Are you interested in weather trends? Then this is the right application for you. There is a special pop-up menu for easy usability. There is no need to follow the values on the vertical and horizontal axes, rather you “tap” anywhere on the chart and more detailed informations are displayed. With the Meteogram app you can access data for your current location or select a location from the database which contains over 110 000 cities worldwide. If you have any feature requests regarding this application please use the contact form. I will try to help you as soon as I can! LorinEAppStore Sweden Best weather app! Wow, finally someone has figured out the best way to display the weather over time. Weather presented in a simple yet, elegant way. Finally an accurate weather app for Sweden. Bästa väder appen! Wow, äntligen har någon tänkt ut det bästa sättet att visa väder över tid. Vädret presenteras på ett enkelt men, elegant sätt. Äntligen en exakt väder app för Sverige. Oliver TaylorAppStore United States Great way to view forecasts The app itself is a little rough around the edges — portrait mode, seems translated, some odd layout choices, etc. — but it is uncluttered and does its job well, and I've never seen anything exactly like it. This is a very useful and an elegant way to look at weather. Paul70_AppStore Russia Very nice and comfortable Conveniently for the overall assessment of the weather, almost all on the same graph. The idea and implementation is very successful. In Moscow precision is quite normal. I would very much like to continue to show pressure in mm. Hg, yet not so bad to make the possibility of withdrawal schedule for 10-12 days and the opportunity to make a copy of the screen or better graphics in the file. Thanks to the author, lead to the development of the program.Очень неплохо и удобно Удобно для общей оценки погоды, все практически на одном графике. Идея и реализация очень удачны. По Москве точность вполне нормальная. Очень бы хотелось в дальнейшем отображения давления в мм. Ртутного столба, еще не плохо бы сделать возможность вывода графика на 10-12 дней и возможность делать копию экрана или лучше графика в файл. Спасибо автору, ждем развития программы. Bjarte MindeAppStore United States My favorite weather app All I need, fast. Charles Perry This is simply elegant. Edward Tufte and Stephen Few would be proud. May I ask how you designed it and coded it? I would love to design something this beautiful myself one day. I do business analytics, scorecards and metrics for a living. This is beautiful. Marc revolApp Store France Clear, sharp and clear Great success graph. Forecast as correct as possible. No hesitationClair, net et précis Belle réussite graphique. Prévisions aussi correctes que possible. Pas d'hésitation. MarkosbAppStore United States Nice weather app I bought it cause of the neat graphics, I like the way the information is presented in the app, it's a really nice weather app. Pward1965AppStore United Kingdom Very good weather app I seem to collect weather apps, and this is one I will use regularly. It presents a wealth of information primarily on a single screen in an attractive layout. Weather information comes from a Norwegian web site. Excellent Support from the developer too - initially the app didn't work; I contacted the Michal the developer and the issue was fixed within 24 hours! Well worth the money. 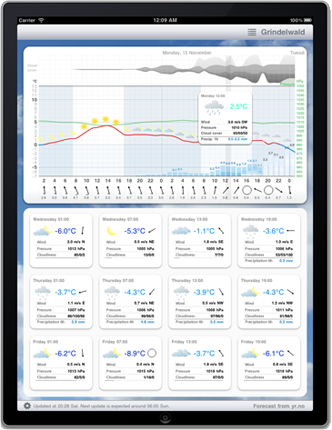 Meteogram meets exactly what I need: reliable, precise and to the point - no knick-knick-design. The other apps (much more expensive and totally unreliable) I will delete now, to make room on my Ipad. I just got far too often annoyed by it. Meteogram trifft genau, was ich brauche: Zuverlässig, präzise und auf den Punkt gebracht - kein Schnick-Schnick-Design. Die anderen Apps (viel teurer und total unzuverlässig) werde ich jetzt löschen, um Platz auf meinem Ipad zu schaffen. Habe mich viel zu oft über sie geärgert. © 2012 Meteogram. All Rights Reserved.